Day 3! We decided to go see the Tokyo Imperial Palace. This day happened to be a Sunday, but thankfully this is not an issue in Japan, as they are not a traditionally Christian country. The hotel we stayed in the prior night was quite far out of the centre in the Ota ward, called Hotel MyStays Kamata. It was fairly decent, and the staff were very friendly. More on this hotel later! Because the hotel was so far out, we had to get the subway in to the city. 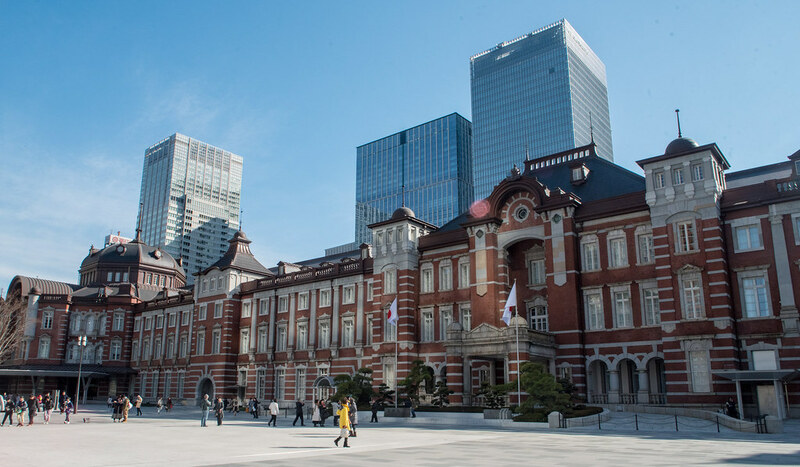 The famous Tokyo Station is quite near the Imperial Palace, so we decided to get off here and walk the last of the way. Located in the Chiyoda’s Marunouchi business district, this train station is the busiest in all of Japan. 3,000 trains stop by per day, with around half a million passengers passing through. The massive buildings of the business district were also quite imposing, but we didn’t dwell here long. We moved onwards towards the palace, bemused by the stark contrast between the palace grounds and the surrounding city. 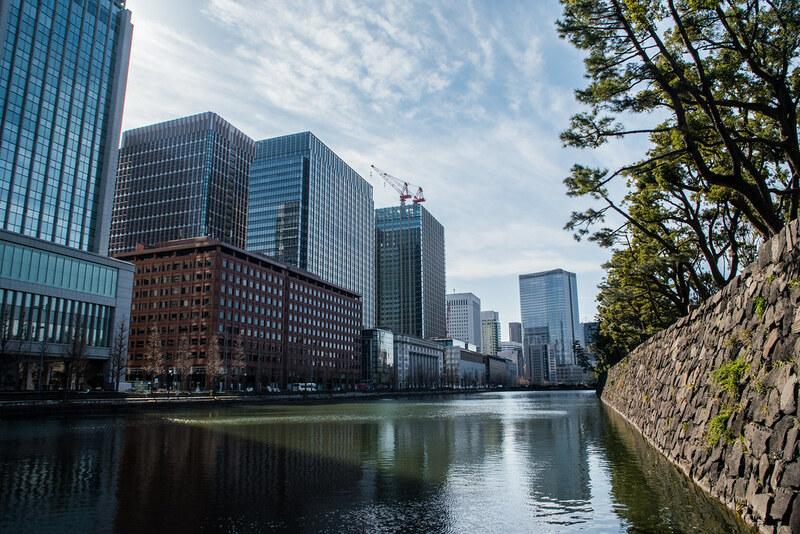 It was never hard to forget that you were in a city whilst visiting the palace grounds, as the surrounding skyscrapers always loomed. 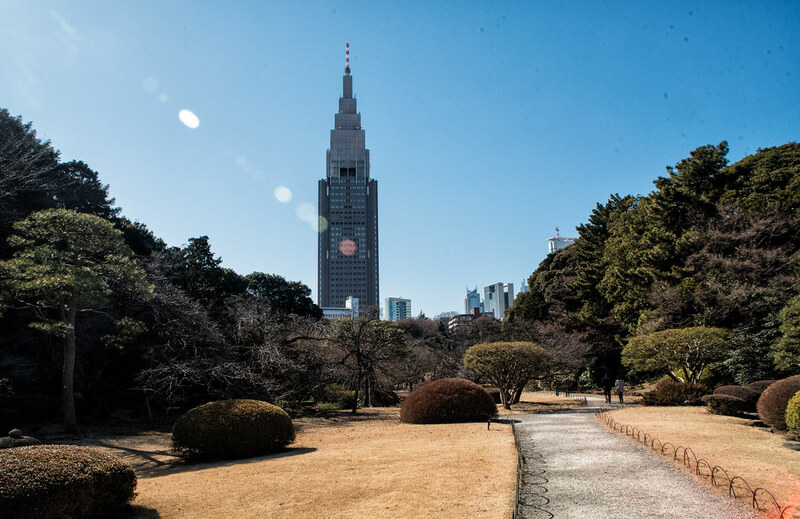 Again, I will be slightly lazy here and point you towards my prior post on my visit to the Imperial Palace Grounds: https://vicharkness.co.uk/2018/04/10/the-tokyo-imperial-palace-grounds/. I say grounds because as it turns out, the palace is only open to visitors on two days a year, neither of which fell on our visit. You couldn’t even really see the palace due to all the walls, but the grounds were nice enough to walk around. From here we head to Shinjuku, a well-known part district. We had plans for the evening- weird ones. It was a little after midday by this point, and so we went on a hunt for food. 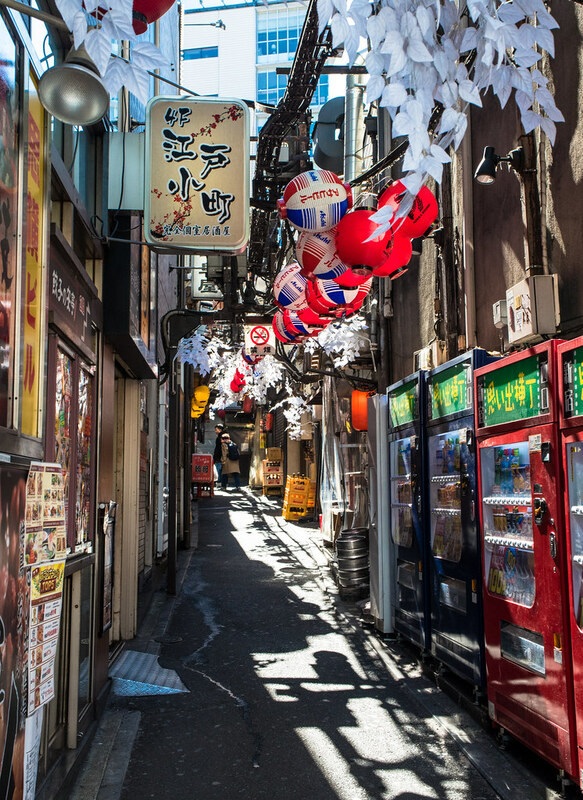 We spotted some narrow alleys adorned by lanterns and bunting, so went to explore. We were beckoned inside a small shop by a greeter, in to a place where the bored-looking (assumedly) child of the owner was the only one to know any English. Again, having Google Translate for Japanese cached on my phone was a god-send. Still, ordering food in Japan isn’t hard so long as you aren’t fussy. Food is a very visual experience in Japan. Restaurants will at the minimum have photos of all food in the menus, but in the case of larger establishments they will also have plastic models of the meals. We saw a store selling such models, and it appeared to be doing good business. So, grab a menu, and guess away! We ordered some sort of meat/veg kebabs, as the stall had huge grills. 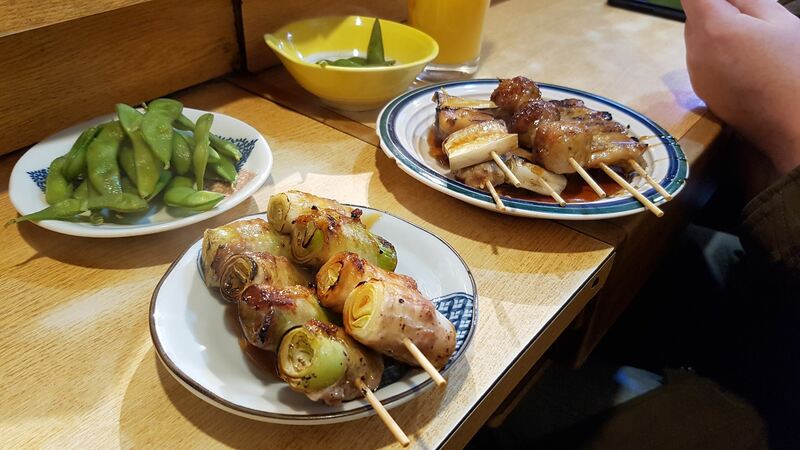 The food we received was quite nice, thin meat wrapped around what appeared to be leeks. The meat sticks were less obvious- after some back and fourth we got a rough translation: pork heart, chicken gizzard. Now I’m not sure what a gizzard actually is, but I can tell you it was very tasty. I was less keen on the heart, it was a bit chewy for my liking- I suppose that it’s to be expected, what with being a muscle and all. As I said, it’s OK if you aren’t fussy. We were guessing with what we were ordering a lot of the time, but both of us were happy to eat whatever we ended up with. Another note on this front: don’t go to Japan if you don’t like raw egg. There will be raw egg, for no apparent reason. If you have a bowl with rice or noodles, chances are they’re going to go ahead and crack a raw egg on that bowl. You can try and mix it in to your hot food to try and cook it, but it won’t work. You just get used to everything feeling a bit snotty. Fortified with offal, we wandered around Shinjuku a little bit. This area is mainly for night-time entertainment, so we didn’t find a whole lot to do. As always, I got in a little bit of street photography. The area seemed to be home to a large amount of department stores, especially selling electronics. 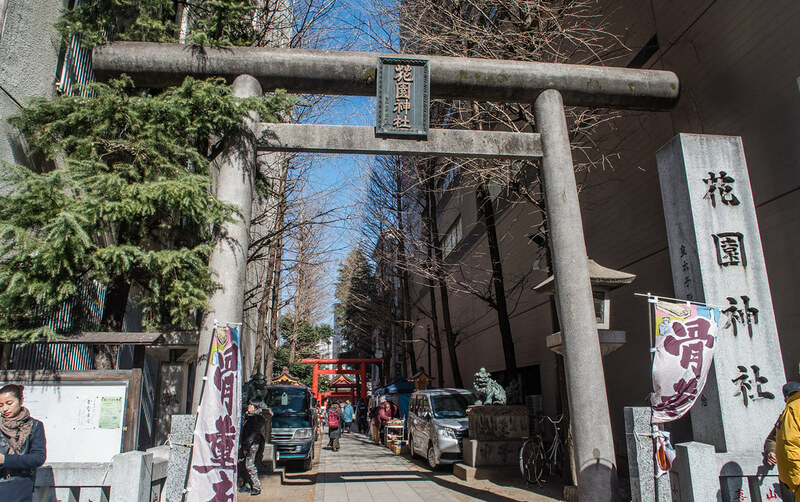 Down a little side street, we spotted a torii. Wandering through it we saw a small temple (Hanazono Jinja Shrine), with a small street market sprung up surrounding it. This market was really interesting as it was more like a car-boot sale- i.e. not touristy. I ended up getting a few souvenirs here! Couldn’t tell you when the market runs however, it was sheer luck that we stumbled upon it. 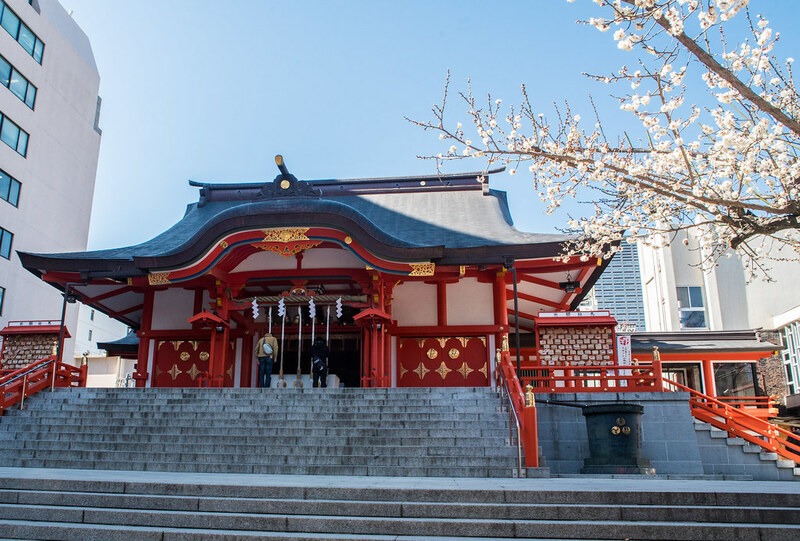 Now seems as good a time as ever to talk a bit more about temples in Japan. The key here is respect: don’t go to them if you’re wearing revealing clothing. Don’t take photos inside them (unless signs state it’s allowed). Take shoes off if you’re moving to an artificial floor. You also shouldn’t visit if you’re “impure”, i.e. ill.
You probably won’t remember all of this, so just lurk nearby and watch what other people do first (that goes for much of the temple experience, actually). Grasp the ladle (I forget with which hand first), and pour the water on to the opposite forearm and hand. Transfer the ladle to the other hand, and repeat. If you want to be proper pure, next pour some of the water in to your cupped hand, then in to your mouth. Rinse and spit, ensuring not to get any back in the reservoir. Don’t be gross. Once you’re nice and clean, you may move on to the temple. There will generally be a large wooden box with slats to catch thrown coins- throw a coin in it. I’m not sure if the amount matters to the kami (Japanese gods). Throw your coin, bow deeply, clap twice, then bow again. The clapping is to draw the attention of the kami. There are also bells for this purpose, but I got the impression that these are more for drawing the ire of your fellow temple-goers. 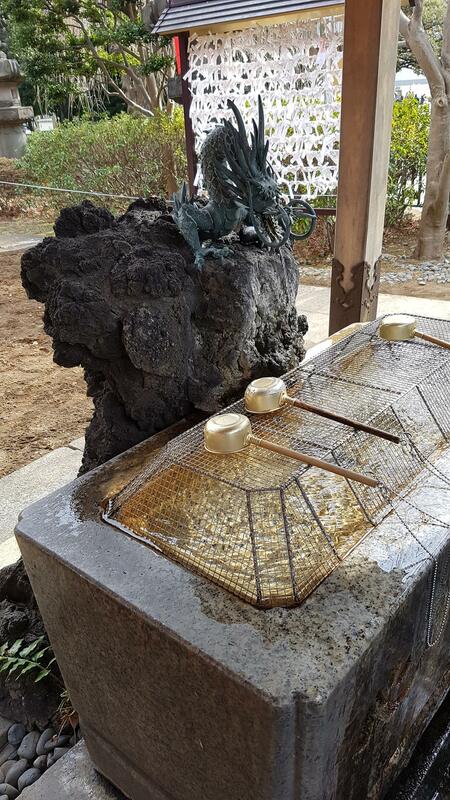 At temples you may also wish to purchase incense to place in to burners. Purchase your incense, light it, then blow out the flames once it begins to smoulder. Place your incense in to the receptacle, and waft the smoke over yourself for good health. In the above photo of the water font, behind it you can see wooden racks with bits of paper tied around it. These are wishes and prayers- write yours on a bit of paper and add it. Strips can generally be purchased on the temple grounds. In the further up picture of the shrine, you can see a similar wooden frame, but with little blocks of wood hanging from it. These are a similar concept, you write your wishes and prayers on them and hang them up here. Again, these can be purchased from the temple fairly cheaply. Some temples sell pre-engraved ones with various sentiments, as well as various charms to take away. 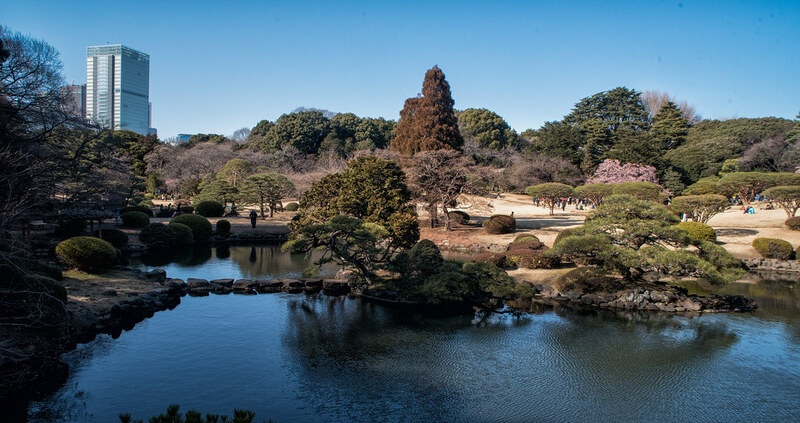 Temple visited, we headed for the Shinjuku Gyoen National Garden to kill time until the evening. 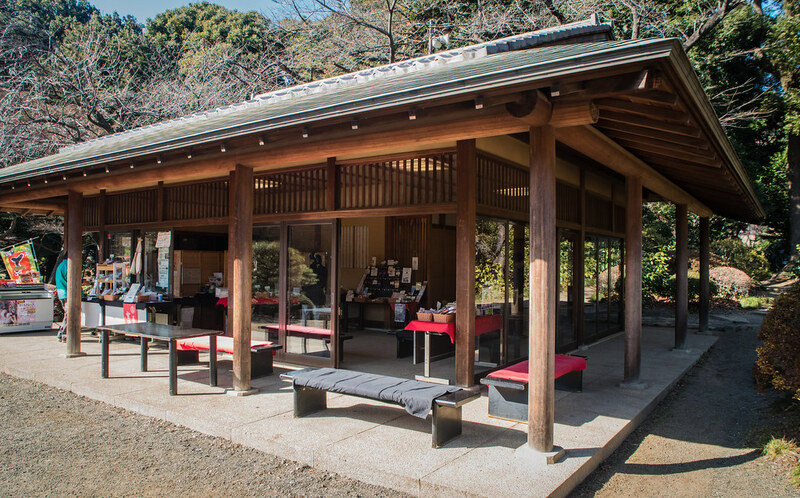 As a side note, this park was in the news recently after it emerged one of the entry ticket vendors was letting white people in for free because he was scared of them (https://www.theguardian.com/world/2018/oct/30/tokyo-garden-loses-fortune-because-ticket-seller-was-scared-to-charge-foreigners). None of that when we were there, but I recall the tickets being fairly reasonably priced (that said, I’m pretty sure my friend paid for mine). The park here is huge, and thankfully maps are provided. Due to the time of year a lot of the attractions weren’t attractive, so we didn’t visit the entirety of the park. We did still quite enjoy walking the grounds. Although as with the Imperial Palace, you were always aware that you were in a city. As well as a café near one of the entrances to the park, there was also a traditional-looking tea stall in the park, which I quite enjoyed. I was not only able to purchase tea, but a pair of Japanese style socks (i.e. with the big toe separate from the rest) with a dragon pattern which I still wear sometimes. This stall generally sold reasonably priced souvenirs, so I’d recommend it. 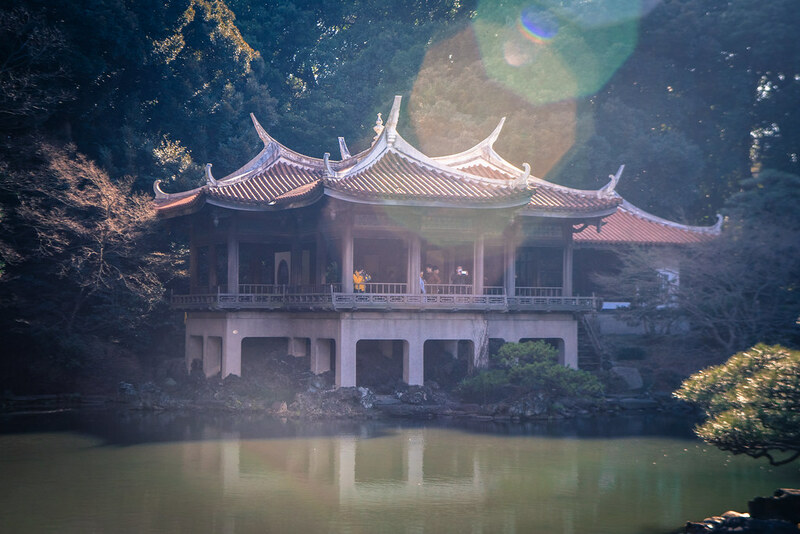 Another interesting structure to visit within the park is the Kyu-Goryo-Tei, also known as the Taiwan Pavilion. This building was donated to Japan by residents of Taiwan in celebration of Emperor Showa’s marriage in 1927. I couldn’t tell you why, his wife appears to have also been Japanese so far as I can tell. 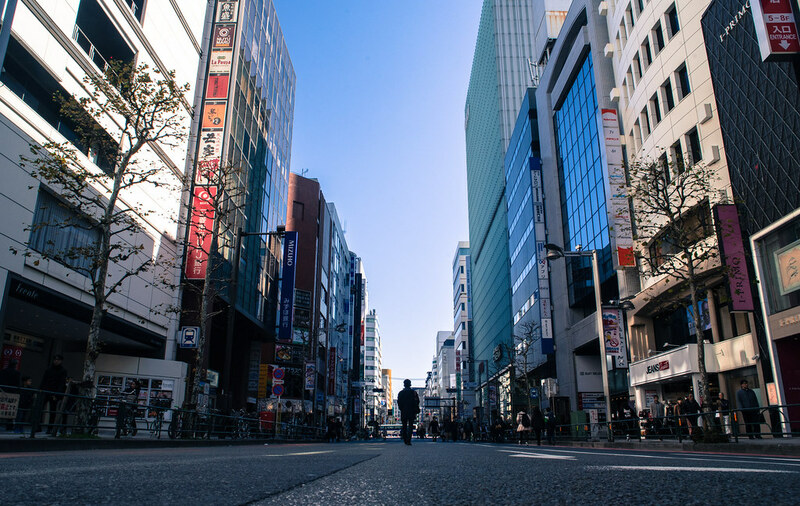 By this time the sun was setting in to dusk, and so we headed back in to central Shinjuku. 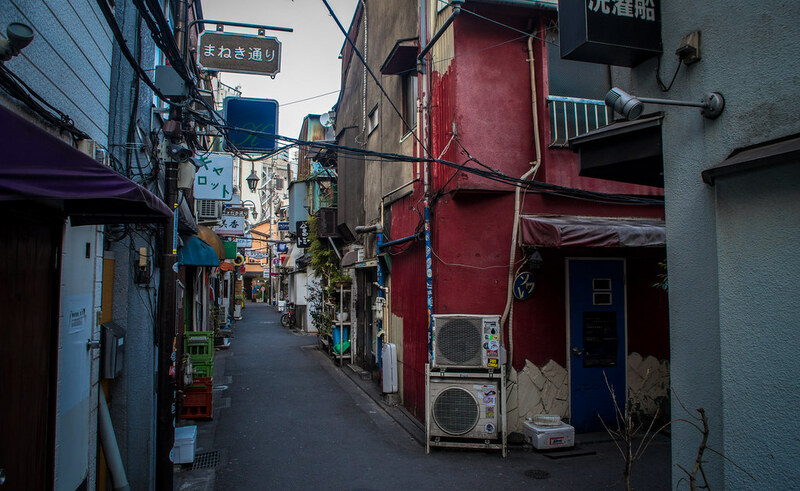 We took a detour through the Golden Dai, a famous nightlife hotspot. Evidentially we were still far too early, as everything was shut. Perhaps they also don’t open so much on Sunday nights. Not sure what the Japanese working days are! 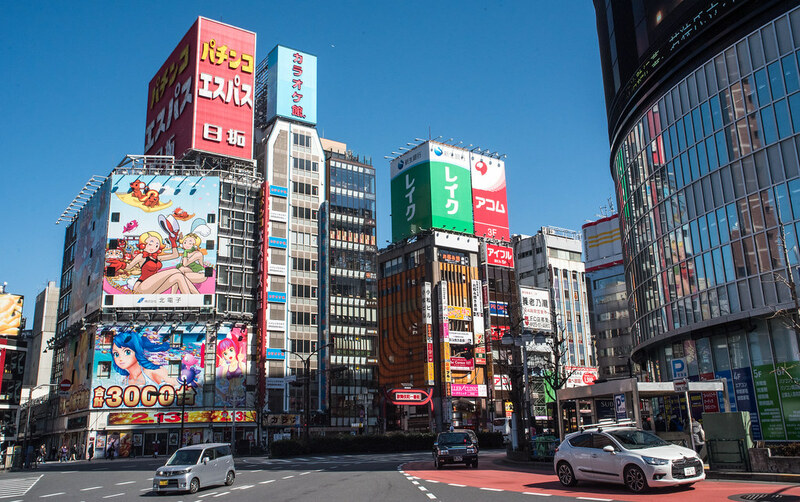 Previous Post My path through Japan: Days 1 & 2: Ueno, Tokyo Sky Tree, Akihabara, Cafes, Sushi!